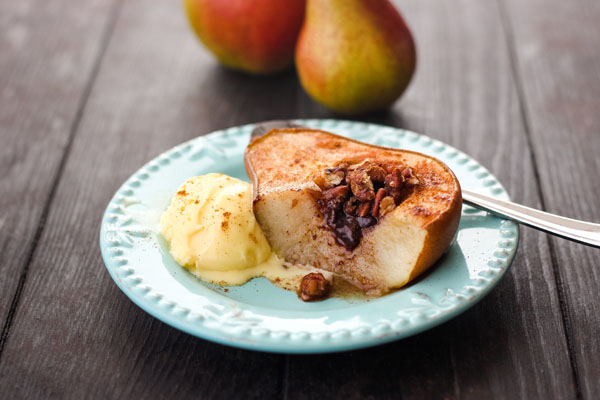 Toaster oven baked pears are an easy dessert for two. They come together in just 30 minutes and have a fun hidden chocolate filling! Fresh fruit is always a good dessert option but after a while, it can turn into a real snoozefest. That’s why I love baking fruit, especially pears. 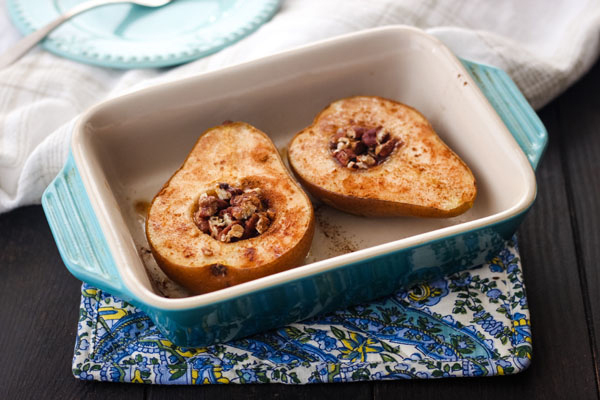 Baking softens the pears and brings out a little extra sweetness. Plus you can dress them up with crunchy chopped nuts and a bit of HIDDEN melty chocolate. What you end up with is a decadent but light dessert that no one would ever call boring. Trying to avoid added sugar? Skip the chocolate and maple syrup. It’s still tasty, just not as sweet and dessert-like. Start by lightly oiling a toaster oven-safe baking dish. If you don’t have a baking dish that fits in your toaster oven you can use a small rimmed sheet pan. A mini cast iron skillet, like the one used to make this toaster oven frittata, will work too. Next, grab a RIPE pear. How do you know if a pear is ripe? The best way to test if a pear is ripe is to gently press your thumb against the neck or stem end. If it gives slightly under the pressure it’s ripe and ready to be eaten (or baked in this case). 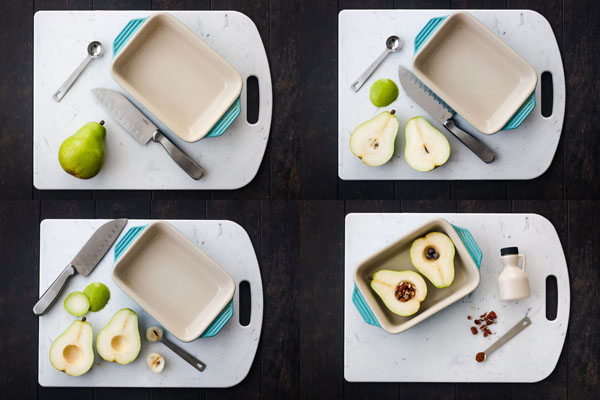 Slice your ripe pear in half and scoop out the seeds. A rounded measuring spoon is a perfect tool for the job. 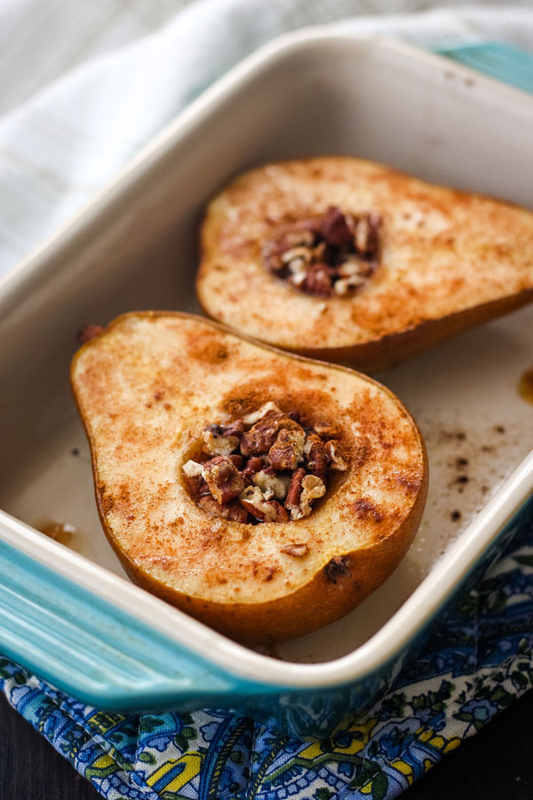 Place the pear halves in your baking dish or pan. If they’re wobbling around all willy-nilly slice a thin strip off the back of each one and they will lay flat. Spices – Sprinkle each half with cinnamon. Sometimes I add a pinch of ginger or cardamom. Chocolate – Pop a few chocolate chips or a small square of dark chocolate in the center cavity. A dollop of peanut butter is another great option. Nuts – Cover the chocolate with a tiny bit of nuts. I used pecan pieces but walnuts are equally delicious. Maple Syrup – Because the pears are already sweet you don’t need a lot. A 1 teaspoon drizzle will go a long way. 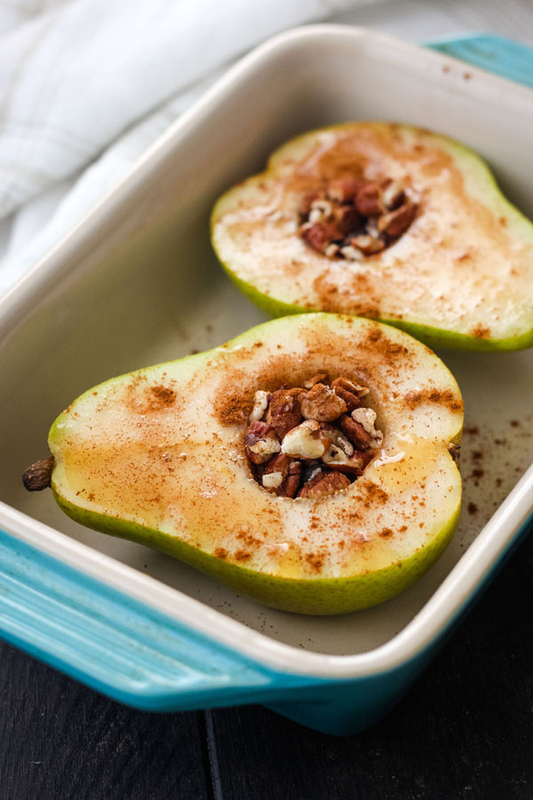 Bake your filled pear halves in a 350°F preheated toaster oven until they have softened. This will take about 25 to 35 minutes depending on the type of pear you use and how ripe it is. With pear season in full swing, I’ve been making this recipe using a variety of pears. Bartlett pears are super sweet and juicy but the texture after baking was kind of mealy. 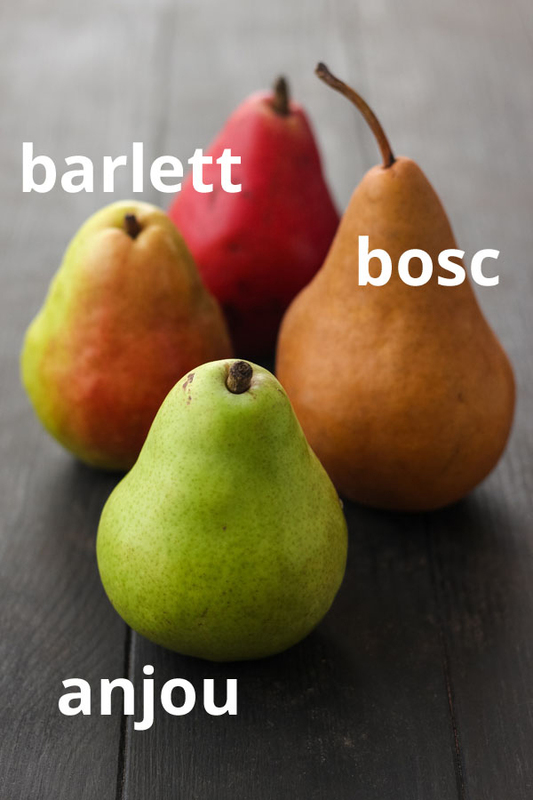 The Bosc variety is less sweet, take longer to bake (about 30 to 35 minutes) and it’s tough to get a spoon through their thicker skin. If you use a Bosc pear I would lightly score the skin before baking. Anjou pears are MY FAVORITE because they are sweet and have a medium-firm texture that turns buttery when baked. To test for doneness I like to give the middles of the pears a little squeeze. It’s the same method I use to check if a batch of toaster oven baked potatoes are ready. 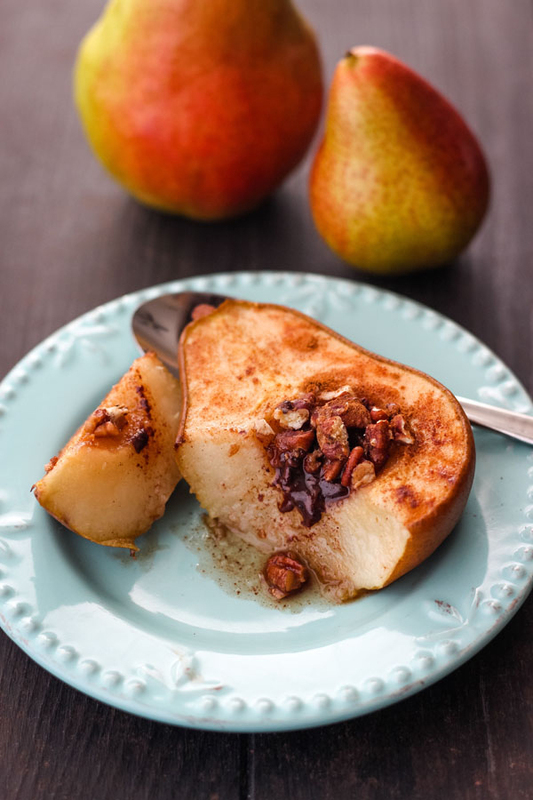 Once your baked pear is tender it’s time for toppings! I usually opt for a dollop of plain Greek yogurt. My husband, and his fantastic metabolism (yep, I’m a little jealous), always goes for a BIG scoop of vanilla ice cream. pears are ideal for baking and i love the ingredients you’ve added! perfect sweet treat.